Wilson, T. B. (2018, Fall 2018). Global Scholars Initiative Summary for UA Global . UA Global Meeting. 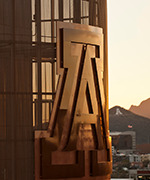 University Services Building, 312: UA Global. Presented a summary of the Global Scholars Initiative to UA Study Abroad, UA Global, November 6, 2018. Wilson, T. B. (2016, January 22). ASSESSMENT OF FIELD WORK - STUDY ABROAD FACULTY – LED PROGRAM . Models in Mobility: Partnerships, Engagement, and Service Learning in the Pursuit of Intercultural Competency. Westward Look Resort, Tucson Arizona: Center for Educational Resources in Culture, Language and Literacy, University of Arizona. ASSESSMENT OF FIELD WORK - STUDY ABROAD FACULTY – LED PROGRAM. I gave a summary of my study abroad class in Namibia, with an emphasis on assessing student reflection and engagement. Wilson, T. B. (2013, September). Taking Students Where They’ve Never Been Before: Field Studies in Namibia . SWES Seminar Series. Marley 230. Wilson, T. B. (2012). Developed and gave a presentation to Dean Burgess about the current status of the SWES academic programs, including enrollment, courses taught, and degree programs . SWES Academic Summary. Wilson, T. B. (2017, April). UA Learning Initiative Blog Post. Assessment Matters Newsletter. I really like transparency in the way we teach students. In particular, and this relates to Zoe's post of "Why", I like to share with my classes what motivates me to teach a course: the learning outcomes. We all have them in our syllabi, but these mostly don't get revisited with the students after the first day of class. Today I dedicated part of my HNRS 170 class to sharing the learning outcomes again with my students, then reviewing which outcome we've reinforced so far with a given class activity.Now, from an assessment standpoint I don't yet have a metric to go by for evaluating this, but I believe it is a good practice for aligning where we are as a class in the semester with the syllabus, and giving the students a sense of progress. What is your perspective? Wilson, T. B. (2010, Fall). Crop Production Major Academic Guidelines. Wilson, T. B. (2010, Fall). Environmental Science Undergraduate Academic Guidelines. Wilson, T. B. (2010, Fall). Introduction to Environmental Class Notes. Wilson, T. B. (2010, Fall). Introduction to Soil Science Lab Manual. Wilson, T. B. (2010, Fall). Introduction to Soil Science. Wilson, T. B. (2010, Fall). Online Education Program Grant for SWES 200. Wilson, T. B. (2010, Fall). SWES Facebook Page. Wilson, T. B. (2010, Fall). Sustainable Plant Systems Major Academic Guidelines. Wilson, T. B., & Wilson, T. B. (2010, Fall). Introduction to Conservation Biology.